I just decided to make this! 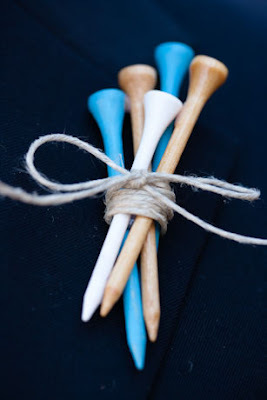 I thought it would be a cute idea for those that have fiancés that are into golf or those that are getting married at a golf club. I bought them in white and natural and painted some blue. You could paint them any color to match your wedding. Here are some more angles of the same. Oh, I LOVE this! What an adorable idea. 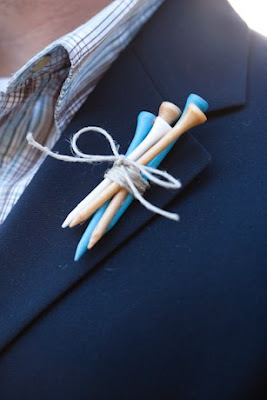 My cousin had a golf-theme reception at Pinehurst in NC and these would have been spectacular! So cute. How creative! What a great idea. I love seeing unique bouts. I have noticed feathers are getting really popular, too. Very cool. I saw this on my wedding photographer's blog from a local wedding. 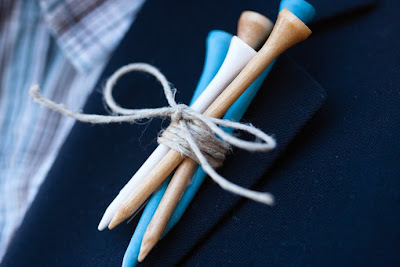 I've decided to do this for my groom and best man... so cute! I think this is such a unique and brilliant idea! It could potentially work with other sports too. My boyfriend and I are hockey fanatics and I've thought about maybe incorporating something hockey into our wedding. i think this is FABULOUS! i'm going totally going to borrow your idea!